A fireplace is a wonderful gathering spot for families to talk, read, watch tv, or just simply lounge around. They bring a unique charm into your home, providing heat, light and beauty. With the rustling crackles and enchanting glow, the fireplace does not disappoint as it promises cozy warmth and a relaxing, tranquil experience for all. 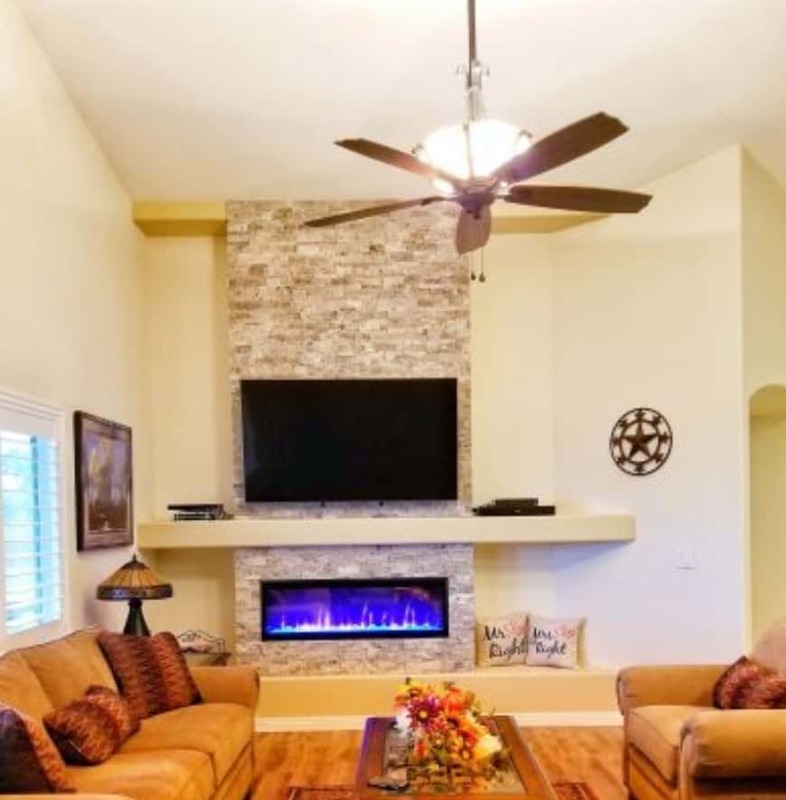 When working with your Las Vegas contractor to install a new fireplace, there are specific things to consider that will narrow down your choices; first and foremost, deciding what the heating functionality of your fireplace will be—wood burning, gas, or electric. Will the purpose of your fireplace be primarily for heat, décor or a combination of both? Or perhaps your priority leans more towards the ease of usage and maintenance? You will need to decide what the overall aesthetic of the fireplace will be, choosing a fireplace that reflects the overall style/theme of the room. There are a variety of fireplace designs from contemporary to traditional that you can explore with your Las Vegas contractor. When hiring a general contractor to install a new fireplace, be sure have a list of topics to discuss so that all your questions and concerns will be answered. Electric fireplaces come already constructed in a box, so there is no need for construction or materials, only hiring someone to install it. They are typically smaller in size, and are therefore popular choices for apartments, condos, and homes with small rooms. However, you may want to hire a contractor to design and build a fireplace surround to accompany your new electric fireplace. If the natural woodsy scent of burning wood and crackling logs is a must, then you will want to make sure you and your home remodeling contractor put construction materials at the top of the priority list when deciding on a wood burning fireplace. Brick is typically the most common choice, as it doesn’t show smoke stains. Stone is also very popular and there are many choices of stone such as marble, slate, limestone or ceramic tile. Although the ambiance of a wood burning fireplace is unbeatable, the homeowner must be willing to accept there will be more maintenance–as well as added cost for wood and a mason to build the chimney. Gas fireplaces have become more and more favorable, as they are more affordable than wood burning fireplaces and require little maintenance. Gas fireplaces provide ambiance and warmth to a room, providing you with realistic flames and glowing embers at the base. Choosing a gas fireplace eliminates the hassles of storing/hauling the wood, as well as the extra expense. You also don’t have to worry about the possibility of bringing insects into the home or struggling to start the fire, as a gas fireplace turns on with the simple flip of a switch. Gas fireplaces can be placed in almost any room in your home, allowing for more design creativity. It is important to choose a gas fireplace with the highest efficiency rating (AFUE-Annual Fuel Utilization Rating). Gas fireplaces come in two basic models: direct-vent and vent-free units, with direct-vent representing the majority. The fireplace location is usually most favored in the great/family room, but you will also find fireplaces in dining rooms, master bedrooms, open kitchen areas, and outdoor living spaces. A fireplace that accommodates both master bedroom and bath is another popular option to discuss with your Las Vegas contractor. Your fireplace design may simply include a mantel, or a complete fireplace surround design with a media center, shelving and cabinetry. Discuss these home renovation possibilities with your contractor for the fireplace surround design that suits your needs. Nothing makes a backyard or patio more inviting than a warm and toasty fireplace. The two most common choices to have a safe fire outside your home are outdoor fireplaces or freestanding fire pits. Freestanding firepits have many style varieties, such as fire pit tables, bowls and chimineas. Fireplaces are safest because they are enclosed within a structure. This removes the risk of smoldering ashes or wind gusts carrying flying sparks. With firepits, you cannot control the draft of the fire…whereas outdoor fireplaces are able to draft themselves. This means you don’t have to be concerned about smoke heading towards you or your guests. No matter what fireplace design and product you choose for your home remodeling, you will be most pleased with an element that is both attractive and made of good use. A fireplace will certainly add significant worth to the home’s resale value, as well as bringing everlasting memories to all.